1. Be hard on the problem, not the people. 2. Understand that acknowledging and listening are not the same as obeying. 4. Give the benefit of the doubt. 5. Have awkward conversations in real time. 6. Keep the conversation going. Life is a dialogue. 8. Be easy to talk to. Key 1: Be hard on the problem, not the people. If you don’t keep the problem separate from your relationship, you risk having the conflict overtake your life (especially after your divorce). When two people who are stakeholders in a relationship are at odds, they sometimes say and do all sorts of irrational things, project, deny, and shift blame. All this drama has nothing to do with solving your problem. But there are things you can do to focus hard on the problem, not the person. The goal is to work with your spouse, rather than being adversarial. Bite your tongue. Think before you respond. Those few seconds of tongue biting can save you a lot of trouble in the long run. Remember that your problem is mutual. You need your spouse in order to solve this problem—and to reach an agreement. You will catch more flies with honey than with vinegar. It takes two to have an argument. If you refuse to take the bait for a fight, the fight can’t happen. Think about the situation from your spouse’s point of view, even if you think he is wrong. Remember, you need this person to sign your agreement. If you only think of your own perspective, you’ll never get resolution. Don’t interpret what is going on based only on your fears. Resist the urge to turn everything into a catastrophe. You will get through this. Don’t blame. Blame doesn’t get you anywhere, especially not now. Let your spouse blow off steam and don’t take it personally. Not everything is an invitation to fight, and even if it is, you’re not coming to that party. Listen. Acknowledge your spouse’s feelings without being patronizing. Be direct; don’t play games. Have your own priorities straight. Though many of these points are common sense, when the relationship gets tangled up in the problem, things can get volatile fast—and common sense gets lost. When you are hard on people, they are no longer open and available to you to help with the problem. You end up with a problem plus an argument to solve. When your spouse knows he is safe from automatically being blamed for a situation, he’ll be able to think strategically rather than defensively. You’ll be able to work cooperatively and collaboratively rather than at odds with each other. Key 4: Give the benefit of the doubt. Before, during, and after your divorce, you’re going to have lots of opportunities to test your ability to give your spouse the benefit of the doubt. Here’s an example: Your spouse is late for a meeting with the bank to see if you can refinance your house. Your first inclination is to take it personally. “How dare she be late again! She does this just to drive me crazy!” But there are also thousands of other plausible explanations which have nothing to do with you: the line at the grocery store was long, and the checker was new; the hamster got out of the cage and had to be found before leaving the house; an important phone call came from a family member at an inopportune time and she didn’t have the heart to tell the caller to put a lid on it. Maybe these explanations are true and maybe they aren’t. If this is not habitual behavior, then find it within yourself to extend the benefit of the doubt. If it’s just once in a while, it’s ultimately easier on everyone not to take it personally. Your blood pressure will thank you. Any time you feel frustrated, annoyed, or mildly irritated, remember that your spouse is human and so are you. We all have our bad days. Also, one day you may be the one asking for the benefit of the doubt, and it helps to pay it forward. Offering the benefit of the doubt helps you practice seeing the best in your spouse. Perhaps you haven’t seen that in a while. Maybe that’s because you’ve been looking for the worst. You and your spouse are both good people who are going through a very hard time right now. Allow your spouse to save face, and when it’s your turn to ask for the same favor, it will be an easier request to honor. Diana Mercer, Esq. is an Attorney-Mediator and the founder of Peace Talks Mediation Services in Los Angeles, California ( www.peace-talks.com ). 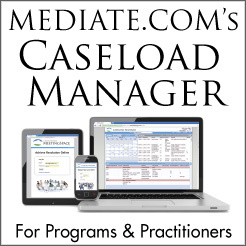 A veteran litigator, she now devotes her practice solely to mediation. Outgoing and down-to-earth, she makes clients and attorneys feel at ease in solving family law disputes, divorces, custody, premarital agreements and estate planning conflicts. She is the co-author of Making Divorce Work: 8 Essential Keys to Resolving Conflict and Rebuilding Your Life (Penguin/Perigee 2010) www.makingdivorcework.com/buybook.html and Your Divorce Advisor (Simon & Schuster/Fireside 2001) and writes for the Huffington Post www.huffingtonpost.com/diana-mercer as well as her own blog Making Divorce Work makingdivorceworkblog.com. She is the co-author of Your Divorce Advisor: A Lawyer and a Psychologist Guide You Through the Legal and Emotional Landscape of Divorce (Fireside 2001). She's an Advanced Practitioner Member of the Association for Conflict Resolution (ACR) and is admitted to practice law in California, New York, Connecticut, Pennsylvania and before the Supreme Court of the United States. "Thank you for providing such an excellent resource for us."